Online quiz becomes more and more prevalent in the web 2.0 era. For bloggers or webmasters, quiz is an outstanding way for engaging readers and growing blog or Web site traffic. For trainers, online quiz is a good e-assessment authoring tool. For business men, an online quiz can also be used as a sales tool. Here are 5 ways to create quiz for online use. Some Flash quiz makers supply an easy way to create professional Flash quiz in minutes. With them, you could create Flash-based quizzes with images, sounds, narrations and Flash animations with up to 10 question types. You also could set feedback to each questions and randomize questions and answers. Some quiz maker also supply free quiz result tracking system, like QuizCreator. Users could track all the quiz results with email or free Quiz Management System. You could view the quiz below which is created by QuizCreator. If you are sophisticated with Adobe Flash editing, you could use Adobe Flash to make quiz for you. Adobe Flash MX and above versions have quiz templates included, and it is designed to automatically track results and send them to a learning management system configured for your quiz. Here is a tutorial about how to create Create a Quiz with Free Quiz Template with Adobe Flash. Create quiz with php script, please have a peek at: http://www.trap17.com/index.php/php-quiz-script_t8729.html. There are numerous online quiz-building tools that can make quiz and grade less of a chore. Do a Google search for "make online quiz free", you will get many free online quiz tools. ProProfs is a free program that is supported by ads, lots of ads. So it is a totally free online quiz program. It features 3 question types. It has many options that control the behavior of your quiz. You could add multimedia objects such as video and image to the quiz, this is rare to a free online quiz tool. 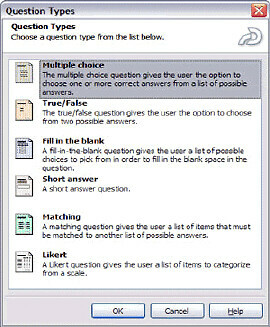 Quibblo and Classmarker also have such features. However, ProProfs sounds the most powerful for a free quiz creation tool. Some screen recorder has the feature of quiz creation. As far as I know, Adobe Captivate and Tech Smith allow user create Flash quiz with them. Take Captivate for example, it contains advanced quizzing functionality that makes it easy to create your own robust quizzes and assessments.